“The next evolution of the Marvel Cinematic Universe introduces the newest member of the Avengers: Marvel’s Ant-Man. Armed with the amazing ability to shrink in scale but increase in strength, master thief Scott Lang joins forces with his new mentor Dr. Hank Pym to protect the secret behind his spectacular Ant-Man suit from ruthless villains! With humanity’s fate in the balance, Pym and Lang must plan and pull off a daring heist against insurmountable odds. 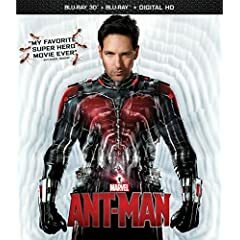 Filled with humor, awesome special effects and exclusive bonus features, this action-packed adventure takes you to new levels of pulse-pounding excitement!” That’s the official description for director Peyton Reed’s Marvel ANT-MAN, now available on Blu-ray 3D, Blu-ray, DVD, and Digital HD. At first, I wasn’t sure about this movie. Ant-Man isn’t really the most well-known Marvel character. He’s certainly not on-par with some others, such as Iron Man or The Hulk. Even with the great cast (including Paul Rudd, Evangeline Lilly, Corey Stoll, Bobby Cannavale, Michael Pena, and Michael Douglas), there was no guarantee of success. But I must say that Marvel and director Peyton Reed really pulled it off and managed to make this one of the best Marvel movies yet. Unlike in the comics, Hank Pym isn’t the Ant-Man. Well, in this movie Pym used to be the Ant-Man, but now he’s older and on the lookout for a protégé. Pym needs someone to once again don the Ant-Man suit in order to protect the world from a new enemy called Yellowjacket. Along comes Scott Lang, a professional thief with a Masters Degree in electrical engineering. Together (with help from Pym’s daughter Hope and Lang’s criminal friends Luis, Kurt, and Dave), they take on Yellowjacket and try to keep Pym’s technology out of the hands of Hydra. Regarding the technical aspects, Ant-Man provides the usual 1080p picture with a 1.85:1 aspect ratio. The visuals are excellent with vibrant color and detailed backgrounds. The movie looks great in both 2D and 3D, especially in the fight scenes where viewers are treated to alternating normal and small perspectives. It’s a rush to see a giant toy train headed straight toward you… you’ll know what I mean when you see it. For audio, the movie provides a DTS-HD Master Audio 7.1 lossless soundtrack. The voice work is excellent with all the dialogue being clean and clear. The foley and soundtrack use surround to great effect and really add to the visually detailed experience. * Making of An Ant-Sized Heist: A How-To Guide (HD, 14:34) – this is a behind-the scenes look at the making of Ant-Man, including filming, production, etc. * Let’s Go To the Macroverse (HD, 8:06) – this is another behind-the-scenes look, but this time focus is on the special effects and how the scaled-down scenes were created. * WHIH News Front (HD, 9:11) – This is fictional news coverage as to what might be scene when watching the news as a character in the movie. It includes a look at the future of Pym Technologies, an interview with Scott Lang about his criminal career, and more. * Deleted & Extended Scenes (HD, 8:36) – Not an absolutely necessary watch, but this section includes some interesting side-notes as they pertain to the characters. * Gag Reel (HD, 3:25) – A few funny bits, but nothing spectacular. * Audio Commentary with Peyton Reed and Paul Rudd – If you’re willing to take the time to listen, this is probably the best of the bonus features. Both Reed and Rudd provide excellent coverage of the film development. Whether or not you’re a fan of the Ant-Man universe, if you like a good story, some fun humor, and a lot of action, you’ll enjoy this movie. Marvel and Peyton Reed really put a lot of time and effort into making the Ant-Man movie live up to the great reputation of the Marvel Cinematic Universe. By the end of the movie, you’ll be looking forward to the next time we see Ant-Man on the big screen. For more information, visit https://www.facebook.com/antman.